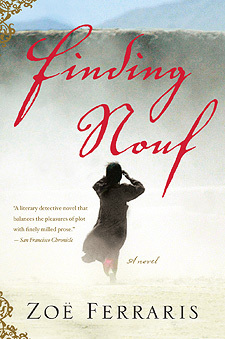 Our meeting in October was about the book Finding Nouf by Zoe Ferraris, a murder-mystery set in present day Saudi Arabia. In this story, 16 year old Nouf, a young woman from a very large, traditional and wealthy Saudi family, had been missing and was found dead and her family is remarkably uninterested in a thorough investigation of the circumstances. But one of Nouf’s many brothers wanted to know the truth, so he hired a desert guide known for his tracking skills and quietly launched a private investigation. As Nayir, the guide, and Katya, the lab worker at the coroner’s office, join forces to unofficially and surreptitiously investigate this strange and compelling case, the readers are taken into an investigation of our own: we are allowed a rare glimpse into the daily life of Saudi Arabians, who live in one of the most gender segregated and closed societies in the world. As the investigation gets more complex, we begin to see all kinds of startling contrasts: the differences between the lives of westerners and middle easterners; the differences in the lives of the wealthy Saudis and the working class Saudis. It also showcases the vast differences in the lives of men and women in the Saudi culture and the religious constraints that prohibit their partnership. By the end of the book, everyone is changed. Nouf’s family is faced with the trauma of having painful secrets exposed. The investigators, Nayir, a traditional Saudi man, and Katya, a more progressive Saudi woman, are faced with the stress caused by their illegal collaboration, which would have frightening legal consequences, and the distress that is caused when they admit to the feelings they develop for each other, which is against all their cultural rules. Every one of them is left with a need to cope with a life changing conflict. Likewise, the readers are left feeling conflicted. The middle-eastern mindset is so alien to us, but if you view our culture through foreign eyes, maybe our western lifestyle is disturbing and sometimes horrifying in its own way. It’s something to think about. Ferraris’s next book, City of Veils, is another fascinating window through which we can peek into the culture of the strict Moslem society in Saudi Arabia. It is another murder mystery with the same two investigators but this time Americans are involved. It’s in this story that the differences between westerners and middle easterners are really examined. I really enjoyed it. It made me think back to another terrific book we read a long time ago that takes place in the middle east (Egypt), Man in the White Sharkskin Suit by Lucette Lagnado, and through these books, I am getting a better idea of that culture and our own.